The Theatre Royal Drury Lane is a London West End theatre in Covent Garden, in the City of Westminster. The building faces Catherine Street(earlier named Bridges or Brydges Street) and backs onto Drury Lane. The building standing today is the most recent of four theatres at the same location dating back to 1663, making it the oldest London theatre. For most of that time, it was one of a small handful of patent theatres, granted monopoly rights to the production of "legitimate" (meaning spoken plays, rather than opera, dance, concerts, or plays with music) drama in London. The first theatre on the location of the Theatre Royal Drury Lane was built at the behest of Thomas Killigrew in the early years of the English Restoration. Actors appearing at the then-called Theatre Royal in Bridges Street, included Nell Gwyn and Charles Hart. It was destroyed by fire in 1672 and Killigrew built a larger theatre in the same spot, designed by Christopher Wren. Renamed the Theatre Royal Drury Lane, it opened in 1674. This building lasted nearly 120 years, under leadership including Colley Cibber, David Garrick, and Richard Brinsley Sheridan. In 1791, under Sheridan's management, the building was demolished to make way for a still larger theatre which opened in 1794. An assassination attempt against King George III took place in this rebuilt theatre on 15 May, 1800. James Hadfield fired two pistol shots from the pit toward the King, who was sitting in the royal box. The shots missed by inches, Hadfield was quickly subdued, and George, apparently unruffled, ordered the performance to continue. On 24 February 1809, only 15 years after its opening, and despite fire safety precautions, the theatre burned down yet again. When encountered drinking a glass of wine in the street while watching the fire, Sheridan was famously reported to have said: "A man may surely be allowed to take a glass of wine by his own fireside." Already on the shakiest financial ground, Sheridan was ruined entirely by the loss of the building. He turned to brewer Samuel Whitbread, an old friend, for help. Whitbread agreed to head a committee that would manage the company and oversee the rebuilding of the theatre, but asked Sheridan to withdraw from management himself, which he did entirely by 1811. The Theater Royal Drury Lane building that stands today opened in 1812, designed by Benjamin Dean Wyatt on behalf of the committee led by Whitbread. It has been home to actors as diverse as Shakespearean actor Edmund Kean, child actress Clara Fisher, comedian Dan Leno, the comedy troupe Monty Python (who recorded a concert album there), and musical composer and performer Ivor Novello. It opened with a production of Hamlet featuring Robert Elliston in the title role. The new theatre made some concessions toward intimacy, seating 3,060 people, about 550 fewer than the earlier building (though this size is still considered an extremely large theatre). In 1820 the portico that still stands at the theatre's front entrance on Catherine Street was added, and in 1822, five years after gas lighting was installed, the interior underwent a significant remodeling. The colonnade running down the Russell Street side of the building was added in 1831. Today, the theatre is owned by Andrew Lloyd Webber and generally stages popular musical theatre. The present building was Grade I listed by English Heritage in February 1958. Theatre Royal Drury Lane has been called one of the world's most haunted theatres. The appearance of almost any one of the handful of ghosts that are said to frequent the theatre signals good luck for an actor or production. The most famous ghost is the "Man in Grey," who appears dressed as a nobleman of the late 18th century: powdered hair beneath a tricorne hat, a dress jacket and cloak or cape, riding boots and a sword. Legend says that the Man in Grey is the ghost of a knife-stabbed man whose skeletal remains were found within a walled-up side passage in 1848. 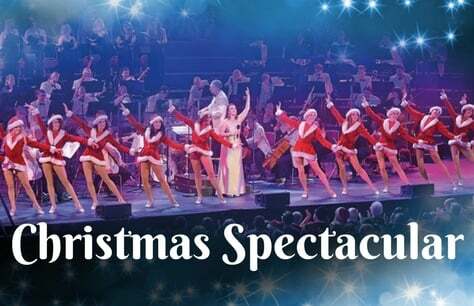 Christmas Spectacular is a cracker of show with music, dance, lights, spectacle and a snow-filled finale. The iconic Theatre Royal Drury Lane will spring to life with high kicks, festive fun and special effects plus all the trimmings in the company of a full show band, west end vocalists and our all-star Jingle Belle Dancers. Join in with toe-tapping tunes and sing-along to seasonal songs including Merry Christmas Everyone, Winter Wonderland, Jingle Bell Rock, Santa Claus is Coming To Town, I Wish It Could Be Christmas Everyday, Sleigh Ride, Have Yourself A Merry Little Christmas, Rockin’ Around the Christmas Tree, Merry Christmas Everybody and many more… It’s the ultimate, unmissable Christmas party.